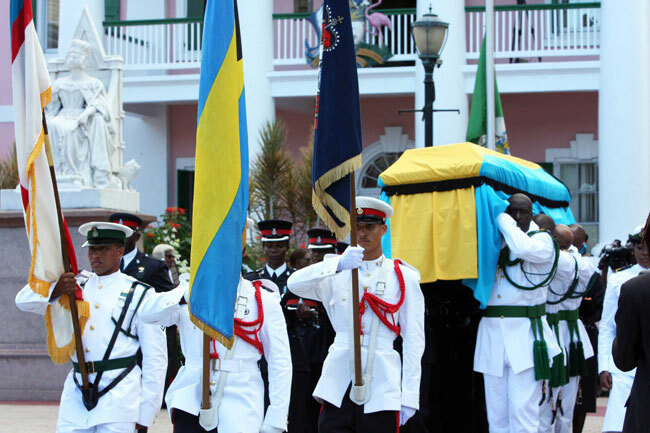 Governor-General, His Excellency Arthur D Hanna and Prime Minister, the Rt Hon Hubert A Ingraham led official mourners. Also paying respect were parliamentarians, senators, members of the judiciary, the religious community, public officers, and representatives of the uniformed branches including the Royal Bahamas Police Force, the Royal Bahamas Defence Force, Customs, Immigration, Road Traffic Department, and Her Majesty’s Prison. Sir Clement, 81, died on Friday, October 2. He is survived by his wife Zoe; and children Dr Peter Desmond, Senator the Hon Allyson Maynard-Gibson, David Michael, and Clement Roland III . A son, Clement Roland Julian, pre-deceased him. 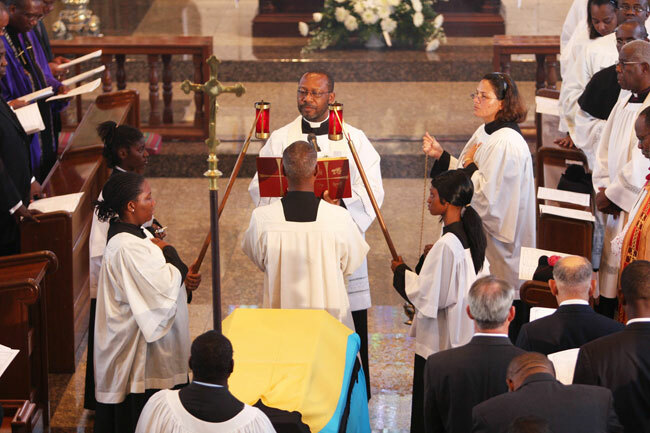 The three-hour service in his honor was conducted by Anglican Bishop of the Diocese of the Bahamas and the Turks and Caicos Islands, the Rt Rev Laish Boyd. Also officiating were the Most Rev Drexel Gomez, the Rt Rev Gilbert Thompson, the Rev Stephen Davies, the Rev Dr James Moultrie, the Rev Dwight Bowe, and the Rev Canon John Clarke. 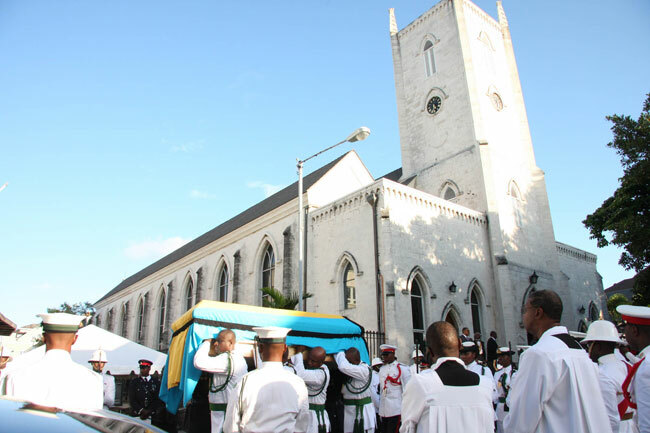 Sir Clement’s body, laid out in a Bahamian-made coffin, draped in the national colors, was placed on a catafalque and taken by official pallbearers and a color party of Police and Defence Force officers in procession to the Eastern Cemetery, Dowdeswell Street, where it was interred. Sir Clement’s political career began when he was appointed Government Leader in the Senate in 1967. He served in the Senate for 15 months. He was first elected to the House of Assembly on April 10, 1968 and re-elected in September 1972, July 1977, June 1982, June 1987 and August 1992. Sir Clement served in a number of ministerial capacities. They included Minister without portfolio from January 18, 1967 to February 20, 1968; Minister of State from February 21, 1968 to April 16, 1968; Minister of Works from April 17, 1968 to October 13, 1969; Minister of Tourism and Telecommunications from October 14, 1969 to November 30, 1971. He has had continuous cabinet membership from January 18, 1967 to August 18, 1992 and has served as deputy leader of the Progressive Liberal Party from 1984 to 1992. He retired from active politics in 1997. 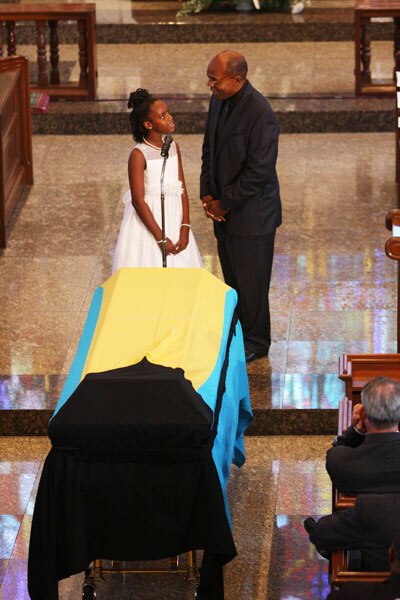 Prime Minister Ingraham described Sir Clement as a national figure, a patriot, a trade unionist, and a nation builder. He said Sir Clement served with “distinction” in both Houses of Parliament for thirty years having been elected on six consecutive occasions and held continuous membership in Cabinet for 25 years. “All these accomplishments account in some measure for our gathering here today, but it was his accomplishments as a man that made so many love an respect him. 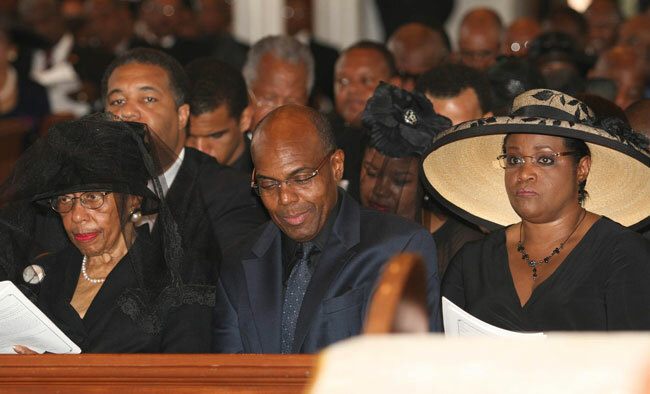 “I am honored for the opportunity to pay tribute and to record how this man of humble origin reached the pinnacle of political success while never losing sight of what he considered most important – his church, his family and the Bahamian people,” the Prime Minister said. Also giving tributes were the Hon Perry Christie, Leader of the Opposition; Senator Maynard-Gibson, daughter, Jason Maynard, grandson; Zoe Gibson, granddaughter; and Edward Maynard, Sr, brother. 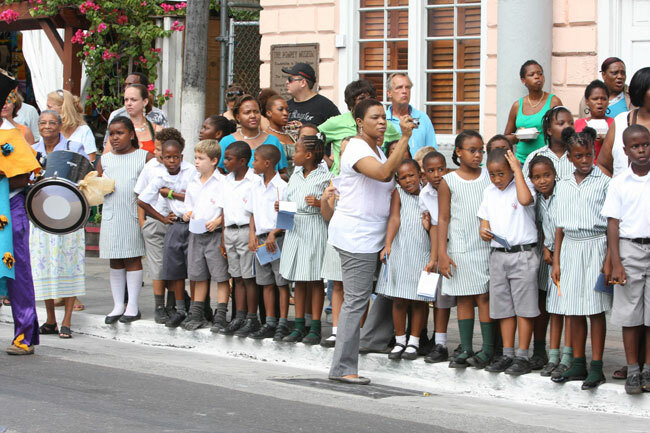 Hundreds of viewers joined by tourists lined the route of the procession that went first from the House of Assembly to Christ Church. Parliamentary pallbearers were the Hon Brent Symonette, Deputy Prime Minister, Attorney General and Minister of Foreign Affairs; the Hon O A T ‘Tommy’ Turnquest, Minister of National Security; Sen the Hon Dion Foulkes, Minister of Labor and Social Development; the Hon Charles Maynard, Minister of State for Culture; Sen the Hon Allyson-Maynard Gibson, leader of the Opposition in the Senate; Mrs Cynthia Pratt, MP; Fred Mitchell, MP; and Dr Bernard Nottage, MP.